The TOTO Vespin II 1G Washlet+ S300e toilet and bidet system marries style and function in one fantastic unit. The Vespin II 1G toilet features an efficient, 1.0 gallon flush that effectively sweeps through the bowl thanks to TOTO’s powerful tornado flush system. 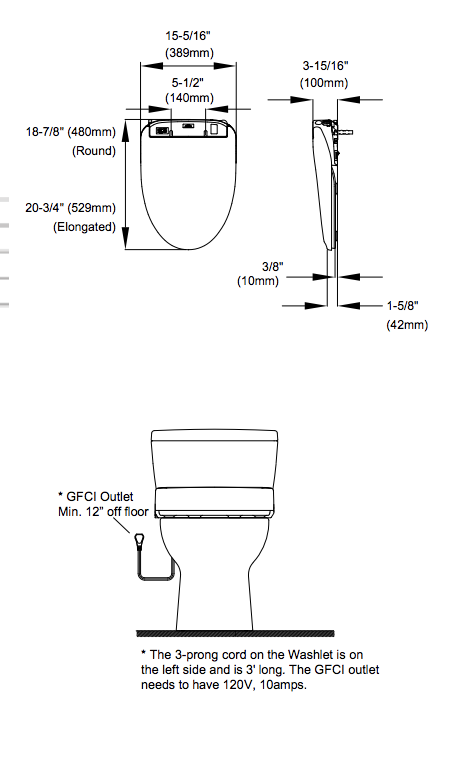 The toilet is also coated with TOTO’s ultra-smooth CeFiONtect glaze that deters residue from sticking, and the Vespin II 1G is a universal height toilet and ADA compliant, making it an accessible option for those with mobility limitations. It’s worth mentioning that TOTO designed the Vespin II 1G toilet and the S300e Washlet+ to seamlessly fit together, with the toilet cleverly concealing the bidet seat’s cords and hoses. This design feature results in a supremely sleek silhouette, though do keep in mind that the S300e Washlet+ included in this system is only compatible with TOTO Washlet+ toilets. The TOTO S300e Washlet+ comes packed with great features designed to skyrocket the quality and comfort of your toileting experience. The S300e comes with four wash modes (front, wide front, rear and soft rear) for comprehensive cleansing, and an instant water heater provides unlimited warm wash water no matter how often or long the unit is used. The water pressure, water temperature, wand position and seat temperature are all adjustable for optimum comfort, and oscillating and pulsating (massage) spray options soothe and relax tender areas. In addition, the S300e comes with a warm air dryer with adjustable temperature settings, allowing you to eliminate abrasive and costly toilet paper from your routine, and the automatic deodorizer eliminates unwanted odors for embarrassment free restroom trips. Two user presets enable you to program your favorite settings into the unit’s remote for a personalized, one-button wash and dry, and the seat’s energy saving mode cuts down on electricity usage when the seat isn’t in use. Furthermore, the S300e takes unit hygiene to the next level by using sterile, electrolyzed water (eWater+) to mist the bowl prior to use and to sanitize the bidet nozzles after each use. With its streamlined look and wide array of features, the TOTO Vespin II 1G S300e Washlet+ toilet and bidet system is a great way to add style and luxury to your bathroom.